Mussolini was born in Northern Italy in 1883. He was a member of the Socialist Party and editor of their newspaper Avanti. He was expelled from the Socialist Party in 1914 when he supported Italy’s involvement in World War One. After the war he formed the Fascist Party. In 1922 Mussolini demands to be made Prime Minister and announces that the Fascist Party will ‘March on Rome’. The King of Italy appoints him Prime Minister. 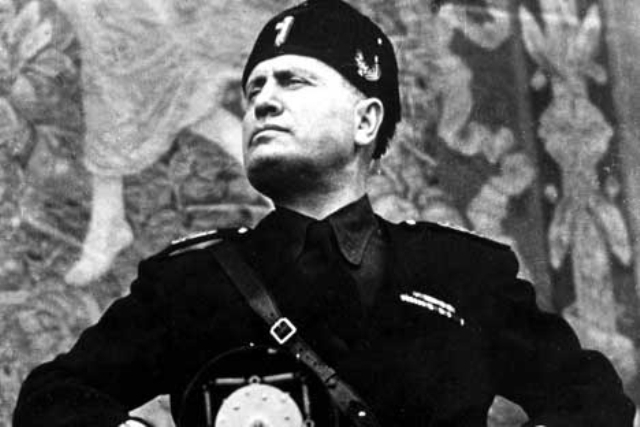 Mussolini sets about establishing a Fascist dictatorship in Italy with himself as ‘Il Duce’. Mussolini uses propaganda and intimidation to control the state. He censors the newspapers and bans opposition parties and trade unions. In 1929 Mussolini signs the Lateran Treaty with the Pope. In 1934 he opposes the German takeover of Austria. In 1935 Mussolini invades Abyssinia. In 1936 Mussolini signs the Rome-Berlin Axis with Germany and in 1939 the ‘Pact of Steel’. He brings Italy into the war in 1940 but the army performs badly. Mussolini is executed in 1945.